Iron & Manganese Removal | Hungerford & Terry, Inc. Drinking water from a wide range of sources can be made sparkling clear and free of turbidity, color, taste, odor, and suspended matter by a well-engineered, low-cost system employing the appropriate Hungerford & Terry filter technology. Well waters containing iron, manganese, and hydrogen sulfide can be economically and effectively treated with our own Ferrosand filter technology. Ferrosand registered trade name for our filtration system. The GreensandPlus medium employs chemical oxidation and reduction in coordination with the catalytic properties to achieve the desired filtration. GreensandPlus’s unique properties permit it to be used in several distinct ways. This gives Ferrosand filtration systems an extraordinarily high degree of flexibility that makes our use of them highly responsive to the demands of the particular application and the specific features of the raw water to be treated. Since 1990, we have been achieving outstanding results by designing systems using the catalytic action of Ferrosand’s manganese oxide coating in the presence of chlorine. Manganese oxides are maintained in a regenerated condition by the oxidizing environment provided by the chlorine. No potassium permanganate is needed with a catalytic iron and manganese removal process. The flux rate for a catalytic system is usually much higher than that available in more traditional systems. The higher flux rate is derived from the nature of the process itself, from the catalytic nature of GreensandPlus, and from attributes of the system design. The process yields unusually long operational runs from 2 to 4 days. 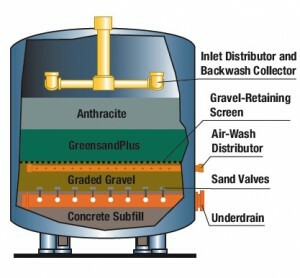 An optional air/water wash prior to backwashing maintains the GreensandPlus in a loose, clean state with little to no compaction. Because backwash volumes are very small — usually 0.25% to 0.50% of system capacity — no recovery is normally required. However, a recovery system to reclaim approximately 85% of the backwash waste can be provided. The The Ferrosand System can be delivered as a completely assembled and packaged unit. It is fully automatic and uses the most advanced PLC controls with a panel mounted touchscreen operator interface terminal. For additional information on this process please contact your local Hungerford & Terry represenative; or you may email or call Hungerford & Terry headquarters today. 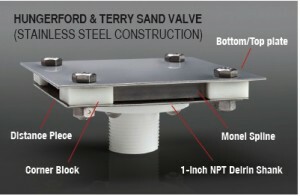 Sand Valve – Our proprietary Sand Value is integral to the Ferrosand systems and the desired performance characteristics. You may select from a number of under drain designs to meet the specific criteria.